From lush, voluminous forests, striking lakes, marsh-filled wetlands to the snow-capped peaks of the Alps; Germany’s landscapes are just as diverse as its storied history. Known as “The Land of Poets and Thinkers”, throughout history, Germans have been muses for art, music, literature, religion, scientific discovery and architecture, and it really shows when one visits. Be it the religious reform of Martin Luther, the spellbinding stories of Johann Wolfgang von Goethe, the hair-raising symphonies of Ludwig Von Beethoven, the incomparable scientific contributions of Albert Einstein or the imposing Gothic architecture; Germany is rich in cultural achievement and history. Indulge in Germany’s varied cuisine, world-renowned beer, and its receptive and cultured people. Overview: After unifying numerous states, Germany became a nation in 1871. Size (land area): 357,022 sq km (137,846 sq mi), three times the size of Pennsylvania and slightly smaller than Montana. Border Countries: Austria, Belgium, Czech Republic, Demark, France, Luxembourg, Netherlands, Poland and Switzerland. Elevation: The lowest point is Neuendorf bei Wilster at -3.54 m (11.6 ft.) below sea-level and the highest point is Zugspitze at 2,963 m (9,721 ft.) above sea-level. Languages: German (official) Danish, Frisian, Sorbian, and Romany are official minority languages. Germany requires U.S citizens to carry a valid U.S passport when traveling to Germany. A visa is not required for U.S travelers whose stays won’t exceed 90 days in a six-month period. Germany is a country in Central Europe, stretching from the Alps, across the North European Plain to the North Sea and the Baltic Sea. Germany has the second largest population in Europe (after the European part of Russia) and is seventh largest in area. The territory of Germany covers 357,021 km2 (137,847 sq mi), consisting of 349,223 km2 (134,836 sq mi) of land and 7,798 km2 (3,011 sq mi) of water. The currency in Germany is the Euro. The Euro is a currency decimal is divided into 100 cents. There are 500, 200, 100, 50, 20, 10 and 5 Euro, and coins of 2 and 1 Euro and 50, 20, 10, 5, 2 and 1 cents. There is no limit to the amount of money that can be introduced into the country.Visitors can exchange money at hotels, banks or ATMs. It is convenient to bring light clothes for summer, and warm ones for winter. It is also convenient to have a raincoat as part of the luggage, no matter the time of the year in which you travel and a sweater is necessary almost any time of year. When it comes to walking, we recommend you to wear appropriate and comfortable shoes, because our tours include visits to many cities that will be covered as a walking tour. German cuisine is characterized by regional diversity and offers a great variety. Inspired by tastes and aromas from the Far East and other places around the globe, German cuisine represents health-conscious dishes, along with traditional recipes as well as international haute cuisine. Breakfast is generally eaten between 7am and 9am. The typical German breakfast consists of bread or rolls with sausage, cheese, jam or honey and muesli, served with coffee or tea. Many restaurants offer breakfast menus, often available until 2pm. Lunch is the most important meal of the day, usually a generous portion served as a hot dish. At around 2 o'clock in the afternoon, especially on the weekend, Germans enjoy "Kaffee und Kuchen", they drink coffee and eat a piece of cake. Cafés and cake shops offer a wide range of delicious tarts and gateaux to eat in or take out. Dinner time is usually between 6pm and 7pm. Anyone who has had only a light lunch will have a hot dish for dinner. The best time to go out for dinner is between 7pm and 9pm. Popular restaurants recommend that you should make reservations in advance. In Germany, tips are commonplace in restaurants, bars, also for drivers and guides. Since the introduction of the Euro, a tip (Trinkgeld, lit. "Drink money") of about 5-10% is customary if you were satisfied with the service. An optimal time to visit Germany because the summer rush has retreated back home, and there are several fall highlights to enjoy. Local wine festivals abound and the autumn changing of the leaves splashes the already awe-inspiring landscape with a fall glow. The holiday season draws in sizable numbers of international travelers because of its otherworldly Christmas Markets that depict Christmas favorites, such as the Nativity Scene and Christmas trees, with stalls that are bathed in light and cheer. German Christmas cookies, hot mulled wine, egg nog, and fruit cake are some of the delights served at these events. Handcrafted ornaments, tree decorations, toys and books are sold. For the winter sports enthusiasts; Germany is hosts to prime locations for cross-country and down-hill skiing. As Germany thaws and shakes away the winter cold; springtime ushers in a myriad of enticing activities and sights. A tradition that was born out of Japanese hospitality after the reunification of West and East Germany; streets lined with Japanese cherry blossoms begin to bloom in the spring. 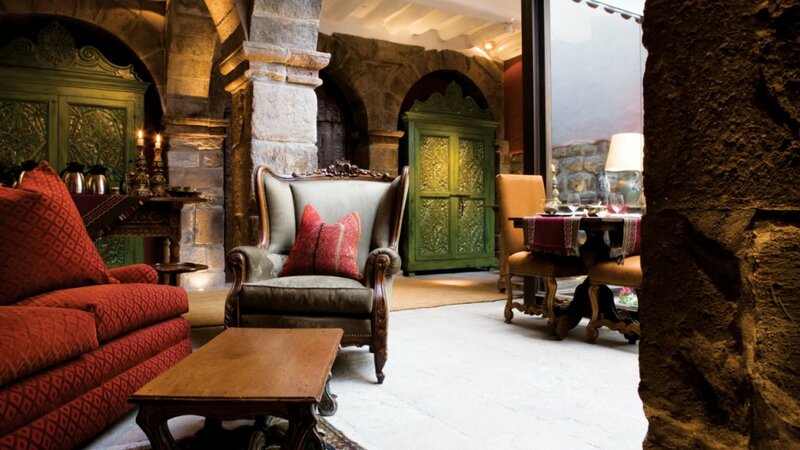 The rising temperatures give travelers the opportunity to enjoy Easter Celebrations, delightful Spring Fairs, and the highly anticipated openings of the world-famous Biergartens. Summertime is when travel to Germany reaches its peak because of the warm weather and memorable days in the sun. Open-air festivals, outdoor pools, sprawling coastline beaches and the season when the Biergartens are at their most resplendent are all highlights that mark summertime in Germany. Like most western European countries, Germany has a moderate climate. January is Germany’s coldest month, while July is its warmest month. The climate is known to have warm summers and moderate, cloudy winters. Northern summers average between 18°C (64°F) and 20°C (68°F), and the winter’s average temperatures can be 1.5°C (34°F) or higher. The inland areas have warmer summers and colder winters than the other areas of the country, since the inland is marked by continental climates. Oktoberfest (October festival) is a 16-day festival held annually in Munich, Bavaria, running from late September to the first weekend in October. Held annually since 1810; It is one of the most famous events in Germany and is the world's largest fair, with more than 5 million people attending every year. 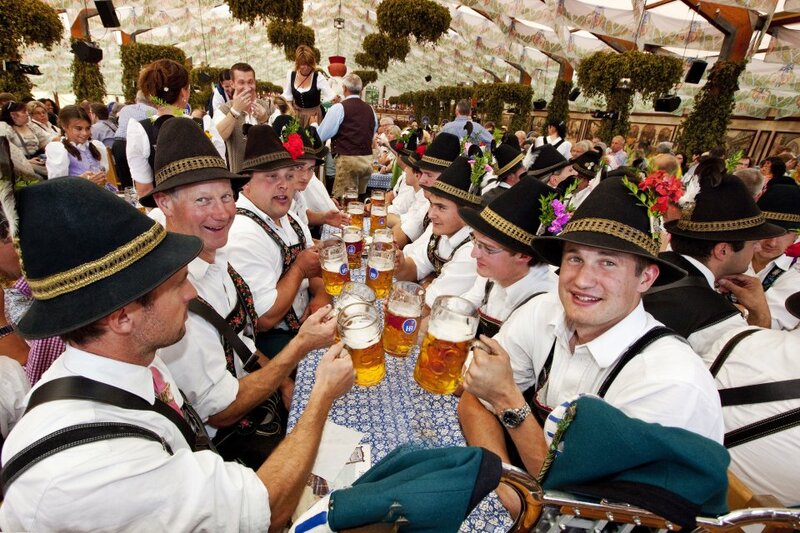 The Oktoberfest is an important part of Bavarian culture. This merry fete is highlighted by amusement rides, traditional German food stalls, traditional folk music, delicious beer and great company. Visitors may also enjoy a wide variety of traditional food such as Hendl (chicken), Schweinebraten (roast pork), Schweinshaxe (grilled ham hock), Steckerlfisch (grilled fish on a stick), Würstl (sausages) along with Brezn (Pretzel), Knödel (potato or bread dumplings), Käsespätzle (cheese noodles), Reiberdatschi (potato pancakes), Sauerkraut or Rotkohl/Blaukraut (red cabbage) along with such Bavarian delicacies as Obatzda (a spiced cheese-butter spread) and Weisswurst (a white sausage). The Cologne Carnival that takes place every year in Cologne. Traditionally, the "fifth season" (carnival season) is declared open at 11 minutes past 11 on the 11th of November. The Carnival spirit is then temporarily suspended during the Advent and Christmas period, and picks up again in earnest in the New Year. The time of merrymaking in the streets is officially declared open at downtown square Alter Markt on the Thursday before the beginning of Lent. Street carnival, a week-long street festival, also called "the crazy days", takes place between the Fat Thursday (Weiberfastnacht) and ends on Ash Wednesday (Aschermittwoch). The highlight of the carnival is Rose Monday (Rosenmontag), two days before Ash Wednesday. All through these days, Cologne folks go out masqueraded. The typical greeting during the festival is Kölle Alaaf!, a Kölsch phrase which can be translated as "Cologne above all!" The magic of traditional German Christmas Markets is casting more visitors under its spell every year. Historic Christmas Markets, held in cities, towns and villages throughout the country, are becoming increasingly more popular, due, no doubt, to the enchanting Festive Season atmosphere they evoke. The Christmas Fairs and Christmas Markets of Germany are unique. If you're tired of commercialism taking over this holiday period and would like to get right away for a real traditional and romantic Christmas Market you might want to consider heading to Germany where Christmas gifts are not mass-produced but craftwork of real quality. Many are difficult to resist - as will be the glass of delicious mulled wine you are offered and the baked apples that are very welcome on crisp winter days. The ambience of a typical German Christmas Market is further enhanced by the aromas of hot chestnuts, grilled sausages and other tasty snacks. Youngsters especially will be attracted to the gingerbread biscuits known as Lebkuchen, marzipan figures and other sweets. Most Christmas Markets start in the last week of November and run through to Christmas Eve or a day or two before. They are usually open every day from 10am to about 8 or 9 pm. Berlin is the capital of Germany; and, also where history and modernity go hand in hand. Known as the Millennium City; Berlin is home to a confluence of culture, art and history, offering endless opportunities for exploration, and boasting over 200 museums. Being the most populous city in Germany and the second largest in the European Union; Berlin has a lot to take in and it’s a kaleidoscope of culture. Admire the majesty of the Brandenburg Gate, a symbol of the re-unification of an entire city. Explore the significance and the physical remnants of the Berlin Wall that drove a wedge through the city’s inhabitants or Museum Island, a hub of the arts and listed as UNESCO World Heritage Site; the city is a dream to the culturally-minded. After the shadow of WWII destruction and the Cold War faded away; Berlin emerged a bastion of cosmopolitan splendor that is a work of art within itself. In the shadow of the Alps, lies, what was once a tiny market town in the 12th century, the vibrant city of Munich. Munich is the capital of the state of Bavaria; which has the landscapes that seem to be straight out of a Brother's Grimm fable, with decadent castles and idyllic surroundings. The city of Munich combines the enchanting backdrops of Bavaria with the buzz of a cosmopolitan city. With museums that are said to rival those in Berlin, historic architecture, luxury shopping areas and the famed home of Oktoberfest; Munich isn't to be missed. The site of several diverse districts like The City Center(Altstadt-Lehel), where tourists flock to historic sites like the Glockenspiel; Maxvorstadt is the University and arts district of the city, the location of two of Germany's finest Universities; and, the Schwabing & English Garden (Schwabing-West, Schwabing-Freimann), an in vogue neighborhood that contains impressive clothing stores, upscale restaurants, cafes, bookstores and galleries. The allure of Munich speaks for itself and what it has to offer will leave you awe-struck. 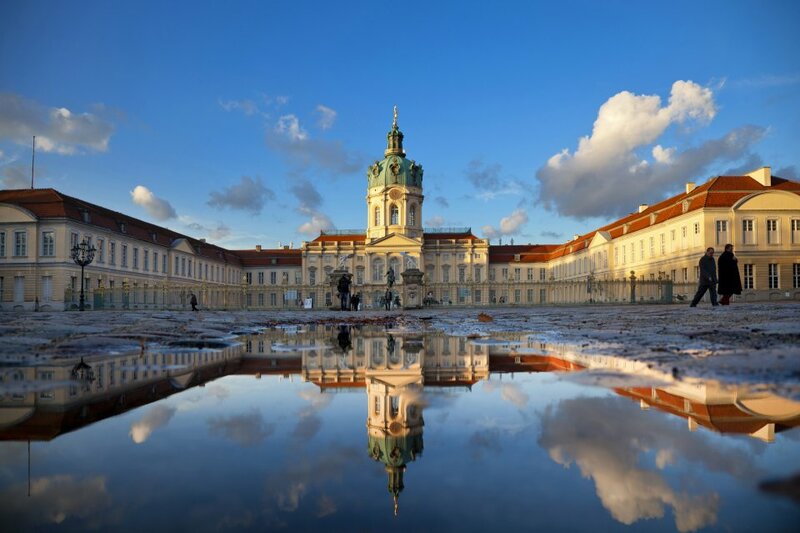 The city on the banks of the Elbe River and the capital of the regal state of Saxony; Dresden has withstood the test of time and the tumult of the Second World War; and has risen to be an august city that is brimming with culture. The baroque churches, spires, domes and architecture is evidence of the once Kingdom of Saxony and the nickname "Florence on the Elbe" is extremely fitting. Considered to by some to be the prettiest city in Germany; Dresden will enrapture you with landmarks like, the Frauenkirche, an 11th century church that was destroyed in WWII bombing raids, but was rebuilt to its former glory, this church represents the city of Dresden being reborn from the flames of WWII to the city that it is today. Indulge in the restaurant and shopping the New Town and Outer New town district offers; this is a huge draw for international travelers. One can also observe the royal ambiance of the Historic Green Vault; the cache of invaluable gems and possessions of the Saxony royals of old. Let the charm of Dresden take you away. Considered the center of finance and business in Germany; Frankfurt has all the bustle of sky-scrapping Manhattan with suitcase wielding businessmen, alongside the grace of historical Germany. Hundreds of thousands of Germans commute to Frankfurt every day because of the German Stock Exchange, the European Central Bank, Frankfurt Airport, leading corporations and the location where all the major German transportation lines meet. 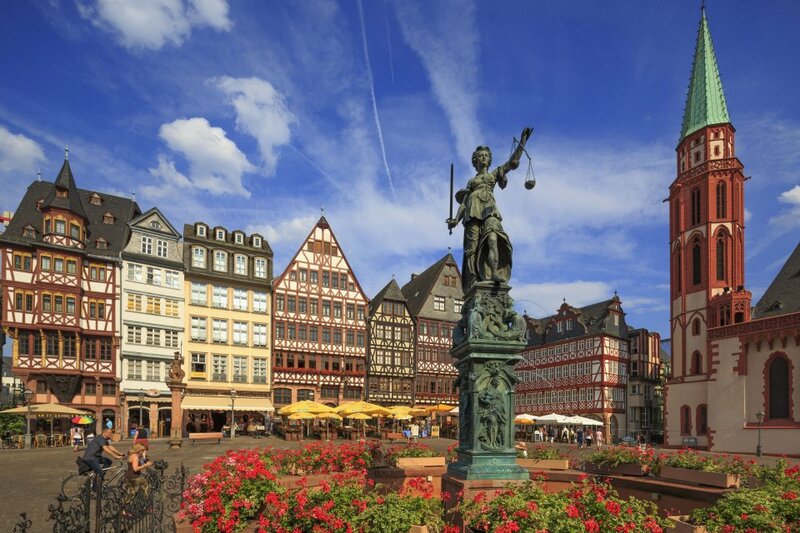 Romer Square, located in the city center, ensconces travelers in the sights of Medieval Frankfurt with the 600 year-old City Hall and the Gothic facades of its buildings sends you backwards in time to a much simpler age. Cologne or Colonia Claudia Ara Aggripinensium, as it was called in 50 BC, when the conquering Romans founded the city, is Germany’s fourth largest city. Known as the “city of exuberance”, Cologne boasts vivacious city life with the backdrop of cathedrals and deep history. When entering the city, you are struck by the enormity of the Kolner Dom (Cologne Cathedral), an UNESCO world heritage site and the pride of Cologne. Explore Cologne’s Old Town, the area of the city where visitors are enraptured by the old-time appeal of its cobblestone streets, city center, shopping streets, museums, and even the renowned Cologne Zoo. Beer enthusiasts can enjoy the local Kolsch beer in many of the traditional breweries or Brauhaus . Cologne is a city where you can wander through the different time periods of Germany history, from its humble Roman origins to a cosmopolitan wonder. Since the Black Forest was where the Brothers Grimm drew inspiration for the setting of timeless fables like Sleeping Beauty, Hansel and Gretel, and Rapunzel; it is no wonder that this area of Germany has striking beauty. With the breathtaking Rhine Valley and the Vosges Mountains surrounding it; The Black Forest can satisfy any nature lover’s sensibilities. Turn back the clock and experience first-hand how the unique Black Forest culture has been living for the past 400 years, with the Vogtsbauernhof museum. Witness the mesmerizing waters of Lake Mummel , Lake Titisee, and Lake Constance. In certain areas, you will be embraced by the sights of the mighty Alps. With surroundings taken straight out of a fairytale; The Black Forest grips visitors’ imaginations.